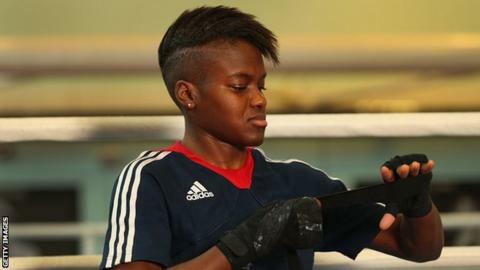 Olympic champion Nicola Adams will face a footballer or a part-time teacher in her semi-final bout at the English National Championships this weekend. Plymouth Argyle's Becky McMullin and PE teacher Kim Shannon constitute half the entrants in the women's 51kg category. The others are Adams and 2014 world silver medallist Lisa Whiteside. Adams and Whiteside are on course for a Sunday showdown in Liverpool, which could help determine who qualifies for the 2016 Rio Olympics. It is the first time in the event's 128-year history that the men's and women's finals will be held as part of the same tournament. "If someone told me a year ago I could be boxing against Nicola Adams in a competition I would have turned it down, because I had such a long way to go," the 23-year-old McMullin said. "But I've come on so much and it will be an amazing experience, whatever the outcome. It will show me what I need to do to get close to her level." The tournament features 14 members of the GB Boxing squad, including 2014 Commonwealth Games welterweight gold medallist, Scott Fitzgerald, and reigning national champions Pat McCormack and Joshua Buatsi. Leeds's Adams, 32, has not boxed in England since winning gold at the 2012 London Olympics and only recently recovered from shoulder surgery. Preston's Whiteside, who won World Championships silver in South Korea in Adams's absence, has dropped a weight in order to challenge Adams for an Olympic spot.